Image credit: © Eric Kilby. From Flickr. Some rights reserved. Pelage: Color variable. Back, flanks, and crown reddish-brown; underparts cream or white. Facial features used to distinguish subspecies, some with a white moustache. Range: Tropical Africa; widespread below the Sahara Desert and north of the tropical belt. Nearly spans the continent, west to east. Introduced population in Puerto Rico. Habitat: Open grassland, savanna, and woodland. Primarily terrestrial. IUCN Status: Least Concern (version 3.1), wide- spread and relatively abundant; assessed 2008. Population in Wild: Numbers unknown. Commonly found in most of its range. Declines in southern geographic range; these populations may have been historic range extensions from previously drier times. Locomotion: Quadrupedal; walk, lope, and run. Fastest primate; may run up to 55 km/hr (34 mi/hr). Climb and leap from trees. Pounce or leap vertically to catch insects. Activity Cycle: Diurnal. May travel long distances in forage for food. Typically rest near mid-day. Sleep alone at night in trees. Social Groups: Live in single male, multi-female groups most of the year. Extra-group males join during the breeding season. Diet: Omnivores. Primarily consume plants; gum, flowers, and seeds make up a large part of the diet. Arthropods, especially grasshoppers and ants, are a dietary staple. Predators: Few direct observations of predators killing patas. Canids, felids, spotted hyena, olive baboon, chimpanzee, and Martial Eagle. Sexual Maturity: Males first reproduce c. 5 years, females c. 3 years; earliest onset of female reproduction of the cercopithecine monkeys. Feature Facts: Diurnal, terrestrial monkey. Long legs enable efficient travel for this animal that spends most of the day on the ground. Climbs trees to sleep at night. Lives in single-male, multi-female groups through much of the year. Groups of 8-71 individuals travel within a large home range in search of food. Gum, thorns, flower and seeds of Acacia trees are a large component of the diet, though arthropods are commonly consumed. Male group leaders are peripheral to females and often sit on a high point apart from others. Females begin reproduction c. 3 years of age, earlier than other cercopithecines; 1 offspring born per year thereafter. Males mature c. 5 years of age or once they join with a female to form a heterosexual group. © 2014-2019 San Diego Zoo Global. Updated July 2014. Taxonomy updated Apr 2019. 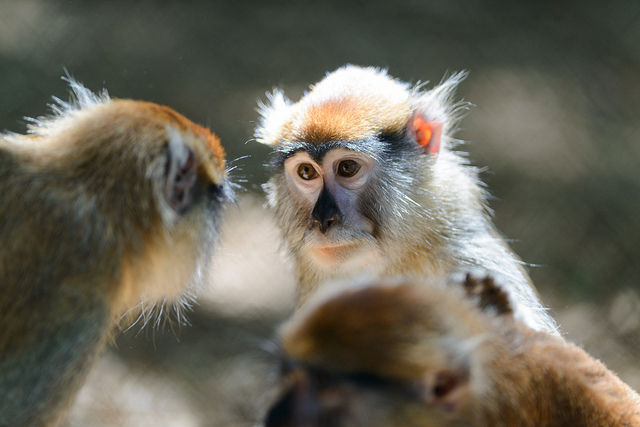 How to cite: Patas Monkey (Erythrocebus patas) Fact Sheet. c2014-2019. San Diego (CA): San Diego Zoo Global; [accessed YYYY Mon DD]. http://ielc.libguides.com/sdzg/factsheets/patas. We extend our many thanks to Dr. Lynne Isbell for providing expert content review of this fact sheet. Dr. Isbell received her PhD in animal behavior and has made great contributions to the field of primate socioecology. Her approach is field-oriented, and she has undertaken multi-year studies in Uganda and Kenya and ventured into other regions of Africa and Madagascar. Dr. Isbell currently serves as professor at the University of California, Davis.